Peel potatoes and dice into 2cm squares. Bring a pot of salted water to the boil and add potatoes. Cook for 5 minutes. Drain and cool. Meanwhile, stir together the sour cream, mayonnaise, lemon rind and wholegrain mustard. Peel and de-vein prawns leaving the tail intact (reserve some prawns to place on the finished dish). Stir in cooled potatoes, prawns, spring onion and capsicum through the sour cream mixture. 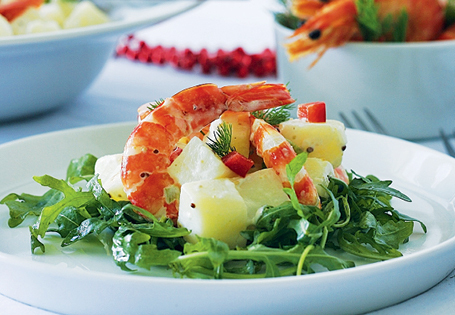 Place a small handful of rocket on individual serving plates and spoon on a serving of the potato and prawn salad. Add the reserved prawns on top. Sprinkle lightly with dill and serve.